Speedys do not include moisture testing reagent, see HAZARDOUS WARNING BELOW. The 6g model is identical to the 20g version except for these two exceptions: it does not comply with ASTM or AASHTO specifications and does not include the steel pulverizing balls. Danger of explosion/fire may result if Moisture Testing Reagent is allowed contact with moisture. Calcium carbide forms flammable acetylene gas when wet so it must be kept sealed and dry. Provide adequate ventilation and use away from sparks and flame. 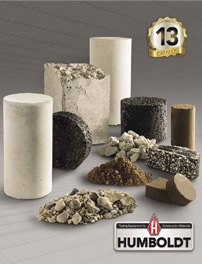 U.S. shipping regulations now require truck shipment for all quantities of calcium carbide. For this reason we no longer provide testing reagent (calcium carbide) with Speedy Moisture Testers. To purchase calcium carbide for use with Speedy testers, please order H-4966, which is a case of 24, 1lb (0.5kg) canisters. This item requires shipment by Truck. International shipping regulations require separate purchase of reagent, which requires "dangerous goods" papers and packing. For this reason, Speedy Moisture Testers for International orders do not contain reagent, order separately. Shockproof, rubber case, great for rugged applications. Max and Hold buttons help in operation.